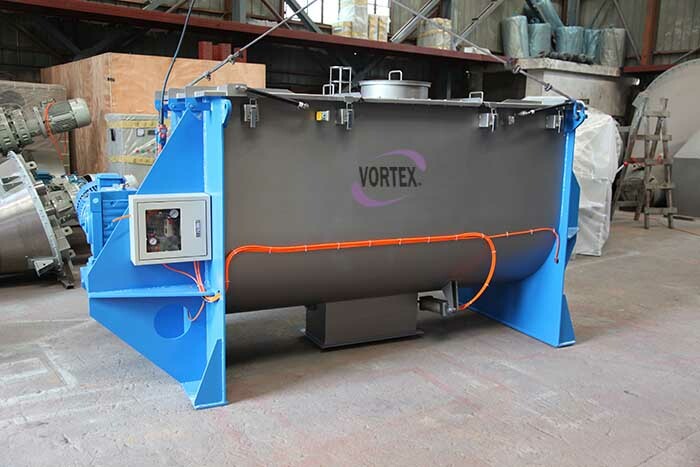 Vortex produces ribbon mixers used in the process industries for rapid, thorough and dust-free blending of powders, granules, pellets and fibers and other bulk solids. Available in many standard sizes from 100 liters to 50000 liters working capacity, vortex ribbon blenders are manufactured for a wide range of bulk densities and applications with many customizable features to meet any special, sanitary or heavy-duty requirements. Pictured is a ribbon blender model VRB-2 with a maximum working capacity of 1400 liters and a full volume of 2000 liters. The stainless steel wetted parts are polished to 300-grit finish for easy cleaning and elegant appearance. The gasketed cover, safety grating and pneumatic operated flap valve are all designed to facilitate convenient ingredient charging and dust-tight operation. The double ribbon agitator is precisely fabricated to produce a well-balanced axial and radial flow of powders while holding tightly-controlled clearances between the trough. The solid agitator shaft is drive to 40 rpm by a 22 kw Siemens motor. The packing PTFE sealing and air purge seal of main shaft also make sure the dust-free blending environment. Unlike traditional belt-drive blenders which are prone to slippage and losses in efficiency, all vortex ribbon mixers are equipped with a direct drive gearmotor for more reliable performance and lower maintenance. With supplied control box, users received a production-ready blender and benefit from electronic speed controls, soft-start capabilities and overload protection without any wiring hassles. Vortex offers many ribbon blenders with an extensive selection of optional features including pneumatic-operate covers, bag dump station, lantern ring, vacuum/pressure design, heating/cooling jacket, liquid spray bar, load cells and PLC recipe system. For more information on Vortex ribbon blenders or other blenders, please feel free to visit our website: www.incmachine.com or email to info@incmachine.com to discuss with our sales engineers for your specialty applications.